These records were published; In Celebration of the Centennial of the Chartering of Mills Collage 1885-1985. A selection of works featuring composers and performers from the Mills Collage Music Department and Center for Contemporary Music. Includes compositions by: Elinor Armer, Robert Ashley, David Behrman, Luciano Berio, Anthony Braxton, Dave Brubeck, Howard Brubeck, Janice Giteck, Anthony Gnazzo, Lou Harrison, Katrina Krimsky, Darius Milhaund, Pandit Pran Nath, Paurine Oliveros, Maggi Payne, Larry Polansky, Steve Reich, Terry Riley, David Rosenboom, Ramon Sender, Morton Subotnik, "Blue" Gene Tyranny. Cover: b/w with a print of The Critic Sees by Jasper Johns! The Mills College Music Department and Center for Contemporary Music are proud to present this three-record set, released in celebration of the chartering of Mills College as a degree-granting institution in 1885. Since that time the Mills College Music Department has gained an international reputation for excellence in composition, performance and historical studies combined with innovation in contemporary musical media. These records contain a mere sampling of the wealth of music that has emanated from Mills College during the last one hundred years. Most of the composers and performers represented are current or former faculty or students at Mills. 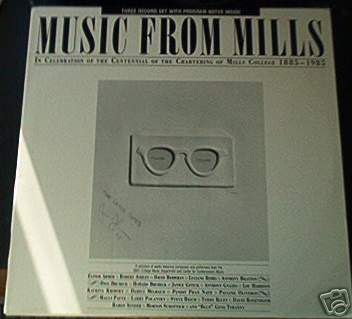 The list of accomplished musicians responsible for the Mills reputation is very, very long. Regrettably, many of these world-class composers and performers are not included in this collection. This is due to limitations of space or circumstances of logistics and time and not to any evaluative, editorial judgements. We hope, however, that this collection will comprise an important historical and archival document and will help continue Mills' long-standing contribution to the evolution of American music. The composers and performers represented on this album have donated their efforts and their music for this limited edition project. To them we express our deepest gratitude. Without their generosity and assistance this album would never have been possible. We also wish to acknowledge past Heads of the Mills Music Department whose tireless efforts and careful support were required to keep Mills in the forefront of contemporary music. In particular, many of the composers represented in this anthology came to Mills during the tenure of Margaret Lyon, who served as Head from 1955 to 1979. This tradition was continued by Susan Summerfield (1979-1984) and David Rosenboom (1984-present) and remains vital today. 0204 - MAGGI PAYNE ? Thank you for posting this! I've been searching forever for a copy!!! 7-zip worked first time 'round for me, folks, without having to rename anything. Thanks for the post, M.S.! Now "on to the écoute" for me. Seems a very interesting collection. Good sound too. And I love the Cembalos, hehe! Hi - can anyone tell me why my computer (a mac) won't deal with RAR files? Is there some special program i need to convert them? This has some beautiful stuff on it, especially the David Rosenbloom track. I can't get the vecond .rar to open either, it has unpacked the first four files and then it closes. Does this rar have the second and third discs on it? Any change for a re-up? As always, I love your blog!! I second that last comment. Could you possibly re-up this one? Would also love a re-up. Been looking everywhere for Giteck's music. I don't suppose you'd consider reposting this? It looks sooooo good - I'd really love to hear it! It doesn't seem to be findable short of a $150 used LP purchase... I'd definitely buy it on cd, or whatever, if i could. Anyway, great blog - love learning about the fantastic artists you post!